You've amassed a vast collection of audio files on your computer, but have you ever taken the time to organize and optimize them? After all, it's no use having something in your collection if you forget that you have it! It's time to take full control over your audio file library with today's discount software promotion, AudioGrail! AudioGrail is the ultimate tool for managing your audio library, letting you rename and tag files automatically and improving fidelity. With AudioGrail, you have the power to perform a deep analysis of the quality of each of your audio files, while organizing them and finding duplicate files that are just taking up space. After you've run AudioGrail against your files, you'll be amazed at how all of the gaps in information, such as artist names, albums, album art, and track titles, are instantly resolved. Featuring support for a broad array of audio file formats, including MP3, OGG, MPC, APE, AAC, and FLAC files, AudioGrail will immediately become an indispensable part of your audiophile experience. You can, for instance, normalize the capitalization of all of your file names and tags, across the board. Or remove tags en masse, and find incomplete tag information. All of this adds up to a fantastic application that will instantly improve the quality and efficiency of your audio collection! After you purchase AudioGrail it may be used indefinitely. AudioGrail is licensed per user, so if more people are going to use AudioGrail you will need to purchase additional copies. Licence name & number must be an EXACT copy paste of provided data. Constantin Florea @Pat ONeil - I am sorry for the delay in getting back to you. I have just resent your receipt email at the address you've used to participate in the promotion. Constantin Florea Please note folks: the vendor fixed the "FLAC fields" issue and made another installer. To download the latest version of the installer which has the issue fixed, please click on the Download button in the receipt email you received for this promotion. It seems to work if I navigate down to specific files - one at a time. 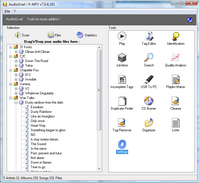 But when selecting a folder containing several music files, I receive an error message. That's when I received a message from Kyle Katarn that the product was limited to 30 files...? I will contact their support to see if I can get help there. Kyle Katarn Contact us from our website if you need support / clarification.